We’d love your help. Let us know what’s wrong with this preview of Out of Wonder by Kwame Alexander. 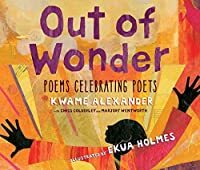 Out of gratitude for the poet's art form, Newbery Award winning author and poet Kwame Alexander, along with Chris Colderley and Marjory Wentworth, present original poems that pay homage to twenty famed poets who have made the authors' hearts sing and their minds wonder. To ask other readers questions about Out of Wonder, please sign up. I’m in the minority here because I wasn’t thrilled by this collection so I’ll be as brief as I can. I am a fan of Kwame Alexander, who along with Chris Colderley and Marjory Wentworth wrote poems in response to some of their favorite poets, including Maya Angelou, Bashō, Gwendolyn Brooks, Sandra Cisneros, Billy Collins, e.e. cummings, Emily Dickinson, Robert Frost, Chief Dan George, Nikki Giovanni, Terrance Hayes, Langston Hughes, Walter Dean Myers, Pablo Neruda, Naomi Shihab Nye, Mary Oliver, O I’m in the minority here because I wasn’t thrilled by this collection so I’ll be as brief as I can. 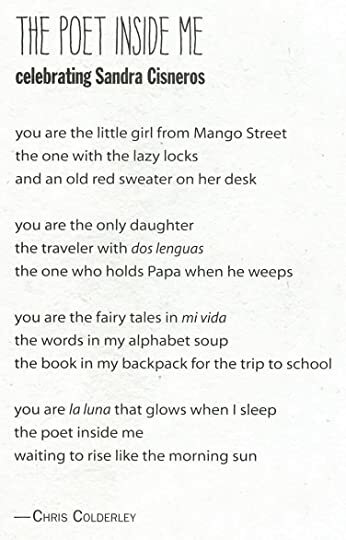 I am a fan of Kwame Alexander, who along with Chris Colderley and Marjory Wentworth wrote poems in response to some of their favorite poets, including Maya Angelou, Bashō, Gwendolyn Brooks, Sandra Cisneros, Billy Collins, e.e. cummings, Emily Dickinson, Robert Frost, Chief Dan George, Nikki Giovanni, Terrance Hayes, Langston Hughes, Walter Dean Myers, Pablo Neruda, Naomi Shihab Nye, Mary Oliver, Okot p'Bitek, Rumi, William Carlos Williams, and Judith Wright. I know and like all those poets, but the book is directed to young children, few of whom will at the present time read the above poets. Some of them wrote poems for children, but none of those poems are included here. Also, the poems written by the authors pale in comparison with their mentor poems. Still, a teacher/parent could create a mentor system for encouraging kids to write their own poetry, which would be a good thing. This book doesn’t do that. Alexander has other collections of poetry with the actual poems from great poets included, of course. That would be a good idea. I like—don’t love—some of the poems in this collection honoring great poets they loved. I see a few echoes of those great poets in these poems. And I like the jazzy artwork. I fell in love with this book as soon as I started reading the preface as the author explains his life growing up with books. His love for books and poetry influenced him to put together this lovely book of poems to introduce poetry to children. 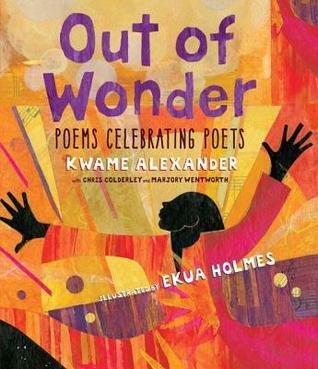 The poems in the book are written by Kwame Alexander, Chris Chris Colderley and Marjory Wentworth. The poems included here honor and celebrate twenty poets from the past and present including Robert Frost, Langston Hughes, Emily Dickinson, and Maya Angelou to name a few. The illustrations alone are beautiful and eye-catching. Once you get to the back, each celebrated poet is highlighted with information regarding their lives and works. In my opinion, this book belongs in every school, every library, and in every home where there are children. It’s worth every penny and I’m happy to have it. One of the most extraordinary poetry picture books I have ever encountered. The poems are incredible but the illustrations! Astonishingly beautiful and powerful! Any teacher, librarian, parent, bookseller or book lover who follows my reviews or who just stumbled across this one-trust me and obtain this title as soon as you can. It will be like no other book in its category you have ever seen. I didn't really read this book today...I read it months ago when I wrote the teachers' guide! But I heard Kwame Alexander and illustrator Ekua Holmes speak at ALA and got an arc, so now it seems real enough to talk about. 20 poems (written by Kwame Alexander, Chris Colderley, and Marjory Wentworth) celebrate the influence of 20 different poets from Rumi to Billy Collins to Emily Dickinson to Langston Hughes to Walter Dean Myers. GORGEOUS illustrations by Ekua Holmes. You will want this book. A wonderful collection of poems that can be appreciated on their own and used as mentor texts. The illustrations are striking, vivid, and match the tone of each poems. I appreciated the three different ways of honoring/being inspired by the poets being celebrated throughout the book. The only thing missing for me was the original inspiration poem side-by-side, or in the back matter, to show more clearly how the new poems matched up to the inspiration. Because I am not familiar with all of them, A wonderful collection of poems that can be appreciated on their own and used as mentor texts. The illustrations are striking, vivid, and match the tone of each poems. I appreciated the three different ways of honoring/being inspired by the poets being celebrated throughout the book. The only thing missing for me was the original inspiration poem side-by-side, or in the back matter, to show more clearly how the new poems matched up to the inspiration. Because I am not familiar with all of them, it would have been nice to have that resource right in the book. Spectacular.This book will win awards. And it will be deserved. A much-needed addition to poetry collections for schools and libraries. Fantastic book for poetry writing with kids. Mentor texts upon mentor texts. A lovely, inspiring collection of original poems celebrating twenty prominent poets: Maya Angelou, Bashō, Gwendolyn Brooks, Sandra Cisneros, Billy Collins, e.e. cummings, Emily Dickinson, Robert Frost, Chief Dan George, Nikki Giovanni, Terrance Hayes, Langston Hughes, Walter Dean Myers, Pablo Neruda, Naomi Shihab Nye, Mary Oliver, Okot p'Bitek, Rumi, William Carlos Williams, and Judith Wright. a song that sounded blue. I guess the rent is due. "Hooray, the rent's been paid!" Since I don't read poetry very often and was not familiar with most of the poets celebrated in this picturebook, I appreciate the short poets' bios at the end of the book. This was a very good book filled with many different styles of poems each very well wrote. To go along with each of the poems there was also a picture that fit seamlessly with the poem. My favorite was the poem called "For Our Children's Children." I liked this poem because there was a lot of description which made it very enjoyable to read. I recommend this book to anybody who is looking for a great book filled with poetry. Out of Wonder is out of this world! Alexander's opening Preface sets the stage for this inspiring collection of poetry! Twenty beautiful poems written by Alexander, Colderley, and Wentworth to both honor and highlight the various styles of twenty amazing poets from the past and present and from around the globe. 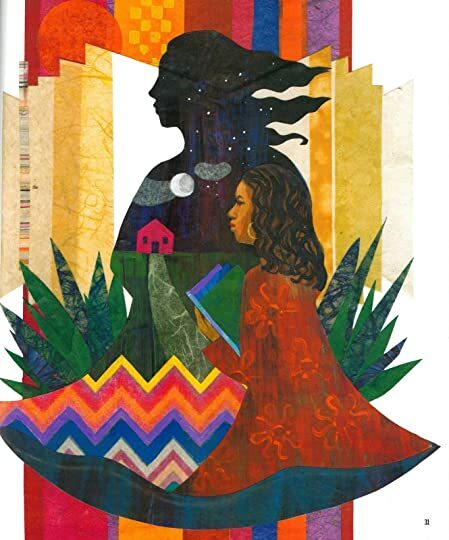 Ekua Holmes illustrations are just as distinguished as the poems themselves. A collection sure to inspire exploration in reading new poets, writing & wonder!!! Simply inspiring! There's nothing like reading a good poem to stir the writer inside, especially when they are inspired by other amazing poets. I can’t see kids understanding these poems. The illustrations are beautiful though. Kwame Alexander has made it his life’s work to share the joy of reading and writing poetry with others. He enlisted poets Chris Colderley and Marjory Wentworth to help him create this anthology to pay homage to twenty of their favorite poets. Each poem in the collection celebrates a different poet and shares insights into him or her as well. Divided into three sections, one part pays tribute to the styles and rhythms of the poets, one incorporates the feelings and themes of the poets, and the th Kwame Alexander has made it his life’s work to share the joy of reading and writing poetry with others. He enlisted poets Chris Colderley and Marjory Wentworth to help him create this anthology to pay homage to twenty of their favorite poets. Each poem in the collection celebrates a different poet and shares insights into him or her as well. Divided into three sections, one part pays tribute to the styles and rhythms of the poets, one incorporates the feelings and themes of the poets, and the third speaks back to the poet about feelings generated by the poet and his or her poetry. A brief biography about each poet is appended, giving depth and understanding. The diverse mix of poets includes Naomi Shihab Nye, Robert Frost, e.e. cummings, Basho, Nikki Giovanni, Langston Hughes, Emily Dickinson, Pablo Neruda, Sandra Cisneros, William Carlos Williams, Chief Dan George, Rumi, and Maya Angelou. Holmes’ colorful, brilliant collage artwork expands the text of each poem. Of particular note is the Bonzeville lady of “Hue and Cry” and the whirling dervish of “Spin a Song”. This would be perfect to use when introducing a unit on poetry, memorizing poetry, or studying one of the poets in the collection. For grades 2-high school. I read many shining reviews of this book and still was unprepared for how great it is. This is a book that s This book is an exploration of famous poets through poems in their honor. Each one captures a sense of that poet whether it is in format itself or subject matter or simply a frame of mind. Turning the pages, one encounters new poets but also old friends. It is with those poets that one knows well that the book truly shines, the homage is clear and the cleverness of the poetry is wonderful. The title of this book comes from a quotation b y Lucille Clifton: "Poems come out of wonder, not out of knowing." This collection of work is a wonder, and encourages readers to learn more about the original poets on whose work these variations are based. Using quality poetry to explore patterns, to attempt similar writing, and to compare with the works of others is a hallmark of quality teaching. This collection will be a must-have title for such teaching, and a "wanna-have" for anyone interest The title of this book comes from a quotation b y Lucille Clifton: "Poems come out of wonder, not out of knowing." This collection of work is a wonder, and encourages readers to learn more about the original poets on whose work these variations are based. Wonder is the best descriptor for how I feel about all aspects of this remarkable book! The poetry is beautifully written and wonderfully captures the essence of the work of each poet tribute. A GEM for classrooms and young readers and poets being introduced to the work and forms of these master poets. And the ARTWORK! Oh my! Absolutely gorgeous and thoughtful. Ekua Homes is extraordinary and I want to frame every one of these for my house. The back matter includes short interesting biographies of Wonder is the best descriptor for how I feel about all aspects of this remarkable book! The poetry is beautifully written and wonderfully captures the essence of the work of each poet tribute. A GEM for classrooms and young readers and poets being introduced to the work and forms of these master poets. Also the artwork is gorgeous. What a stunning collection that every classroom should have! "...a trendsetter/ and a rule breaker/ crafting/ a new American voice..."
"...let the sun enter your heart,/ and find a way/ to keep it there." "Know your beauty/ is a thunder/ your precious heart unsalable." Though I suggested Grimes' One Last Word wasn't helped by the juxtaposition of her work with her inspirations, it was still critical in a book like that to have them. Out of Wonder doesn't even do that, greatly reducing the value of this book for students. Though again I think the new poems would suffer if placed directly alongside their inspirations. This book has a nice conceit, but last year's When Green Becomes Tomatoes has raised the bar for sheer quality for poetry for children. This book is awesome! I loved everything, from the preface to the notes at the end. The illustrations are beautiful. The poets who put together this collection more than do their inspirations justice. I legitimately squealed a little when reading both the e.e. cummings poem and the Billy Collins poem. They were so spot on! I found myself feeling nostalgic for poetry as I read this. I have a ridiculous TBR stack right now but I hope I get a chance to wade into some poetry soon! Another picture book I'd use if I was still teaching English and poetry--really great poems written in the style of iconic poets throughout time. Would be cool to read these homage poems in conjunction with the original poets' work, then read poems by Alexander and his compatriots and have students try their hand at homage poems. Inception poetry! But truly, I loved these poems--several of them gave me hope on a day I was feeling hopeless. 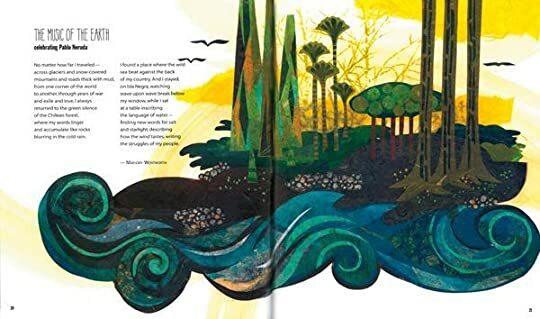 Out of Wonder is full of beautiful poems and illustrations for each of the poets being celebrated in this book. This is really a wonderful way to introduce children to a wide array of poets in just one book. If one or more particularly stands out to them, they can choose to do further exploration through works written specifically by that poet. This book is a wonderful collection of poems that celebrate the work and style of renowned poets such as Robert Frost, Walter Dean Myers, Emily Dickinson, and many others. 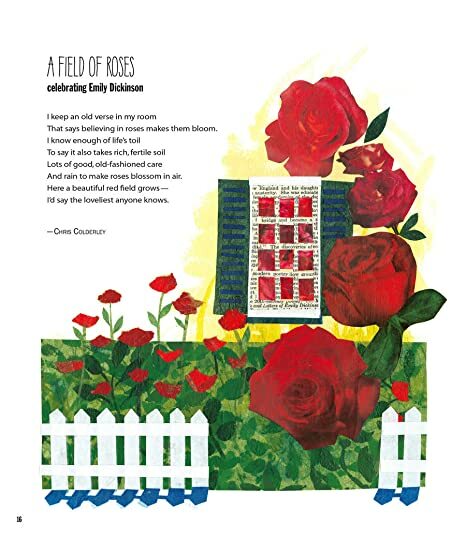 These poems are beautifully illustrated with mixed media artwork. This would be a great companion to Keep a Pocket in Your Poem: Classic Poems and Playful Parodies by J. Patrick Lewis and a great addition to any bookshelf. Truly gorgeous, both poems and pictures! 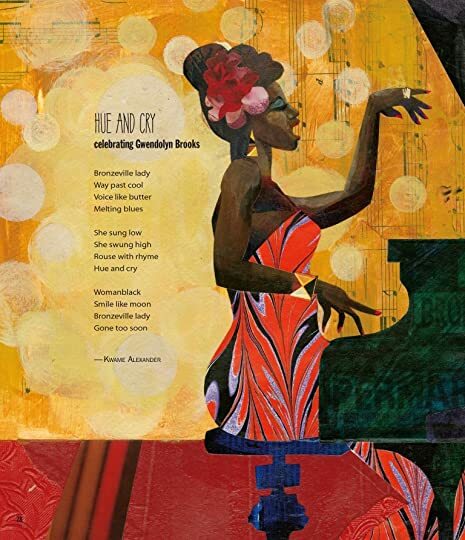 My absolute favorites include "The Music of the Earth" celebrating Pablo Neruda, "Tambourine Things" celebrating Judith Wright, and "Hue and Cry" celebrating Gwendolyn Brooks. I hope this book will inspire children to write their own poetry expressing wonder. For all the teachers out there who use mentor texts with their students, this is a perfect mentor text for, well, mentor texts. Each poem is written in the style of a particular poet, from Robert Frost to Naomi Shihab Nye to e.e. cummings. I will be using this in my HS classes moving forward! A lovely collection that pays homage to incredible poets of different time periods using Alexander, Wentworth, and Colderley’s voices to interpret them. With an illustration and a short biography of the poet at the end, it teaches about style, mimickry, and celebration. Kwame Alexander is a poet, educator, and New York Times Bestselling author of 21 books, including THE CROSSOVER, which received the 2015 John Newbery Medal for the Most Distinguished Contribution to American literature for Children, the Coretta Scott King Author Award Honor, The NCTE Charlotte Huck Honor, the Lee Bennett Hopkins Poetry Award, and the Passaic Poetry Prize. Kwame writes for children Kwame Alexander is a poet, educator, and New York Times Bestselling author of 21 books, including THE CROSSOVER, which received the 2015 John Newbery Medal for the Most Distinguished Contribution to American literature for Children, the Coretta Scott King Author Award Honor, The NCTE Charlotte Huck Honor, the Lee Bennett Hopkins Poetry Award, and the Passaic Poetry Prize. Kwame writes for children of all ages. His other works include SURF'S UP, a picture book; BOOKED, a middle grade novel; and He Said She Said, a YA novel.